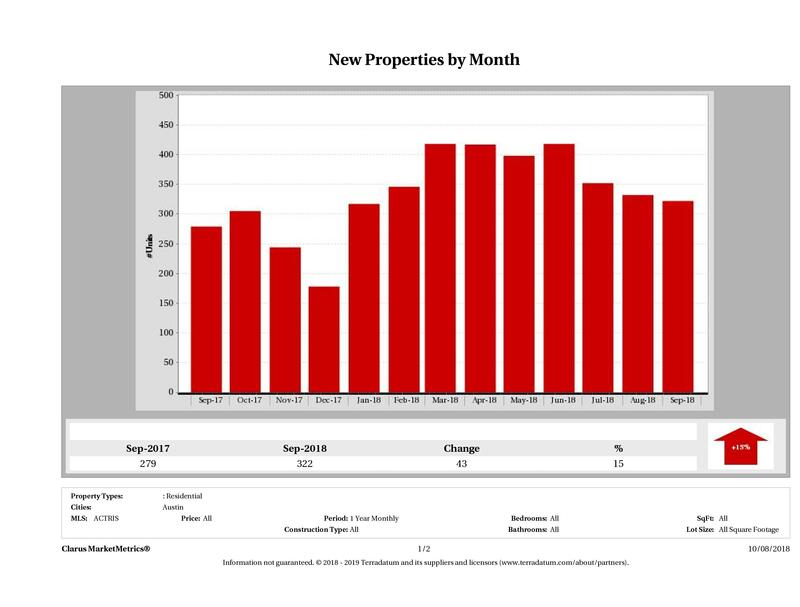 Eleven Oaks Realty is proud to present their September 2018 Austin Condo Price Report measuring activity in the Austin condo market. 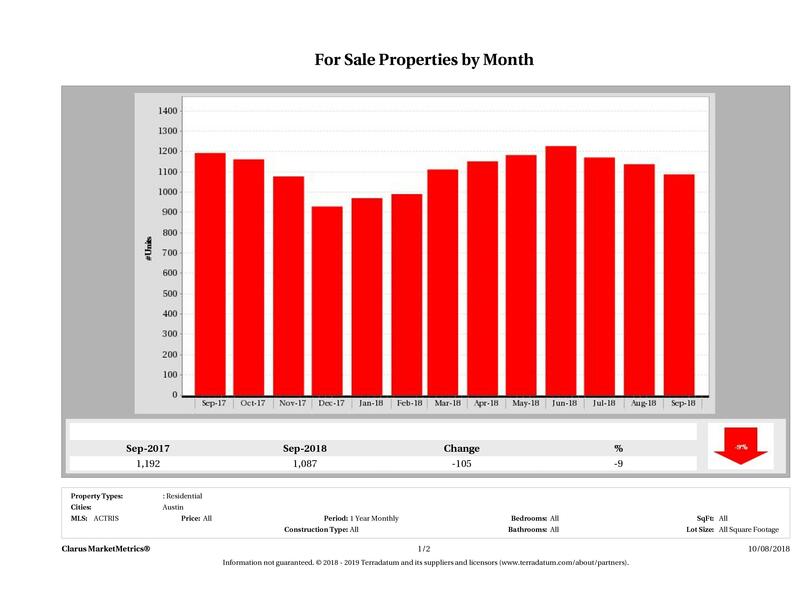 The September 2018 Austin Condo Price Report covers all condominiums and townhomes in the City of Austin. In September 2018, 197 condos sold in Austin compared to 247 in September 2017, marking a 20% (50 condo) decrease in year over year numbers. 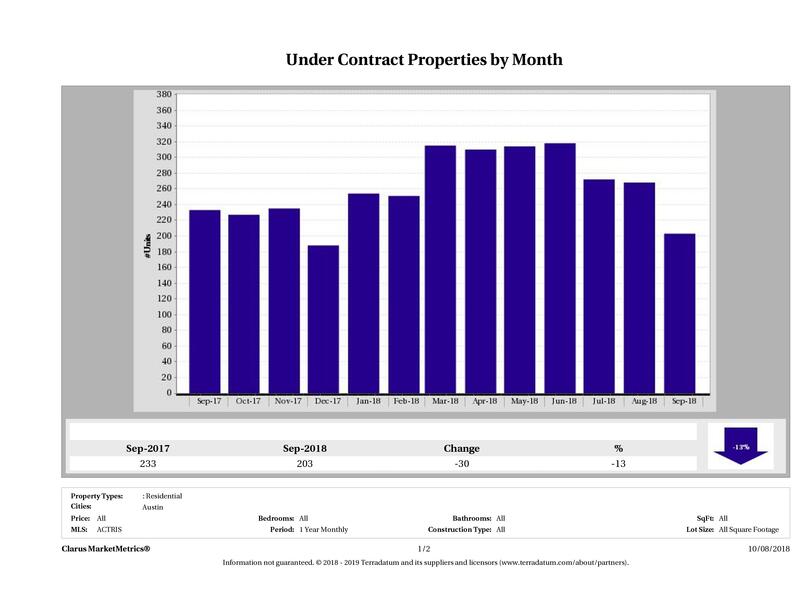 In September 2018, there were 203 condos that went under contract (pending) in Austin compared to 233 in September 2017, showing a 13% decrease (30 condos) in year over year numbers. 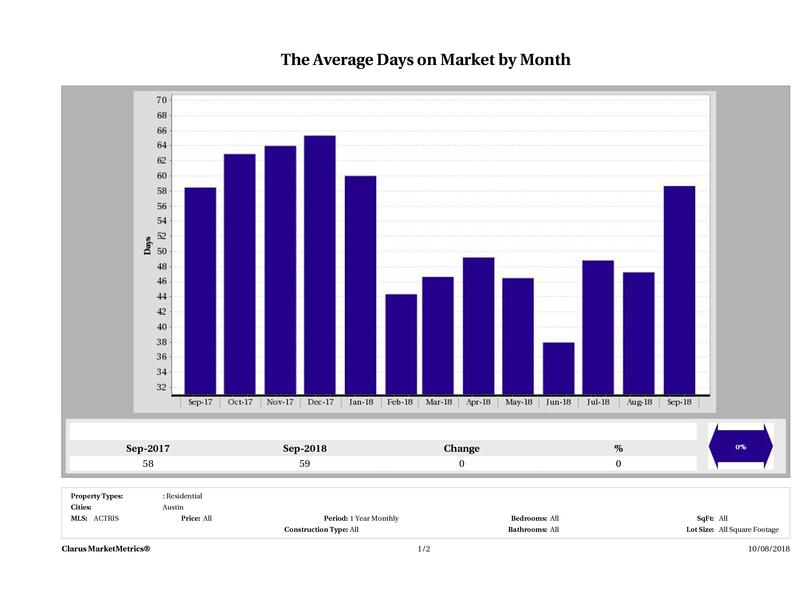 In September 2018, it took 59 days to sell a condo in Austin compared to 58 days in September 2017 marking no change in year over year numbers. 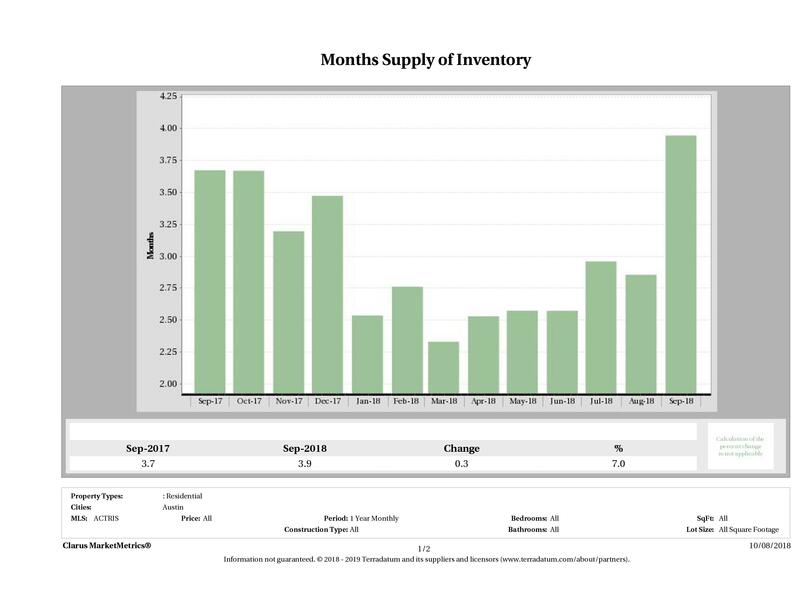 In September 2018, we had 3.9 months of inventory on the Austin condo market compared to 3.7 months in September 2017, showing a 7% decrease in year over year inventory numbers. In September 2018, there were 322 condos and townhomes listed for sale in Austin compared to 279 in September 2017 marking a 15% increase in year over year numbers. In September 2018, there were 1,067 condos and townhomes for sale in Austin compared to 1,193 in September 2017, a 9% decrease in year over year numbers. This year buyers have many more options than they have in years past, but inventory is returning to the lower numbers we have seen over the last few years. 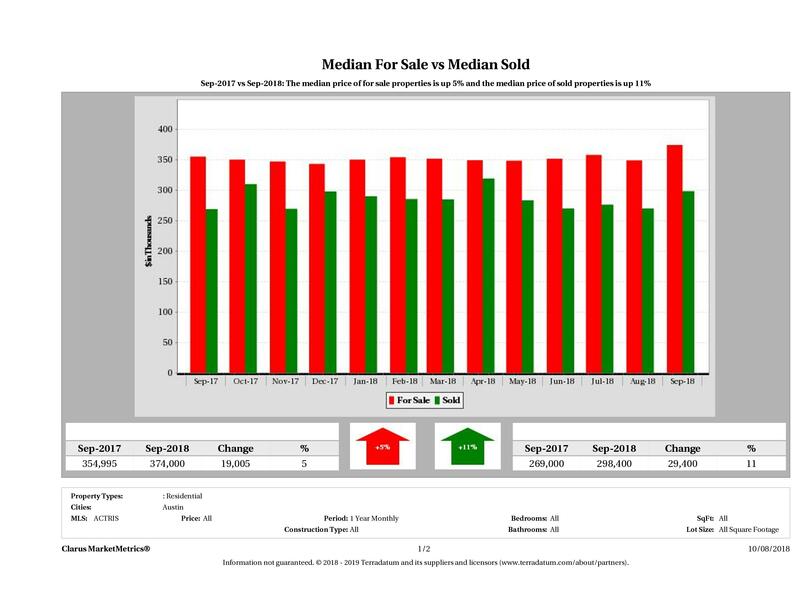 In September 2018, the median sold price of a condo in Austin was $298,400 compared to $269,000 in September 2017, marking an 11% ($29,400) increase in year over year numbers. This is a strong stat for sellers. 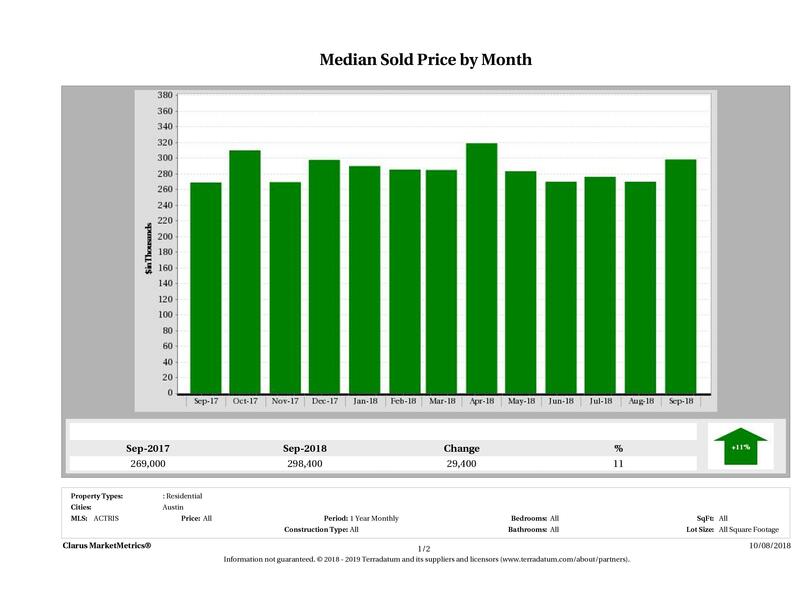 In September 2018, the median price of a for sale condo in Austin was $374,000 compared to $354,995 in September 2017, up 5%. The median sold price of a condo in Austin went from $298,400 in September 2017 to $269,000 in September 2018, marking an 11% increase. 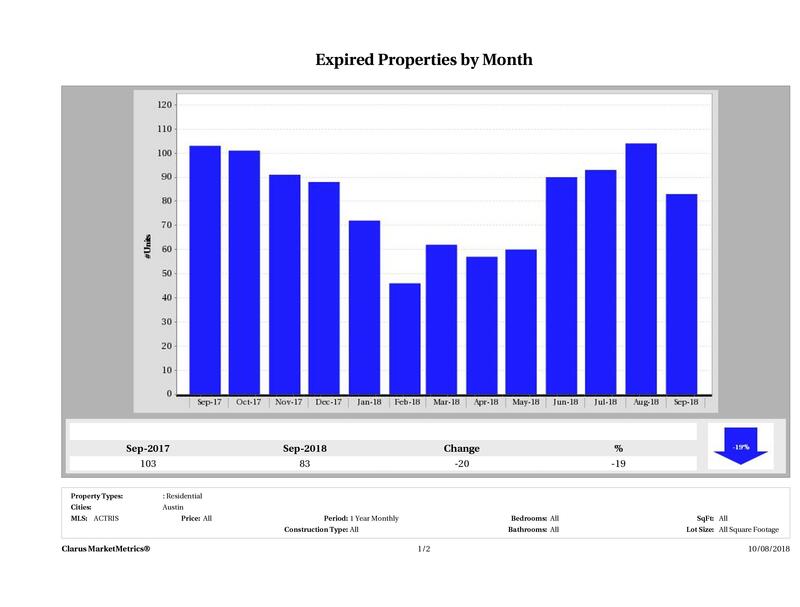 The number of expired condos in Austin (number of condos that were taken off the market) was up 19% or 20 condos in year over year figures. 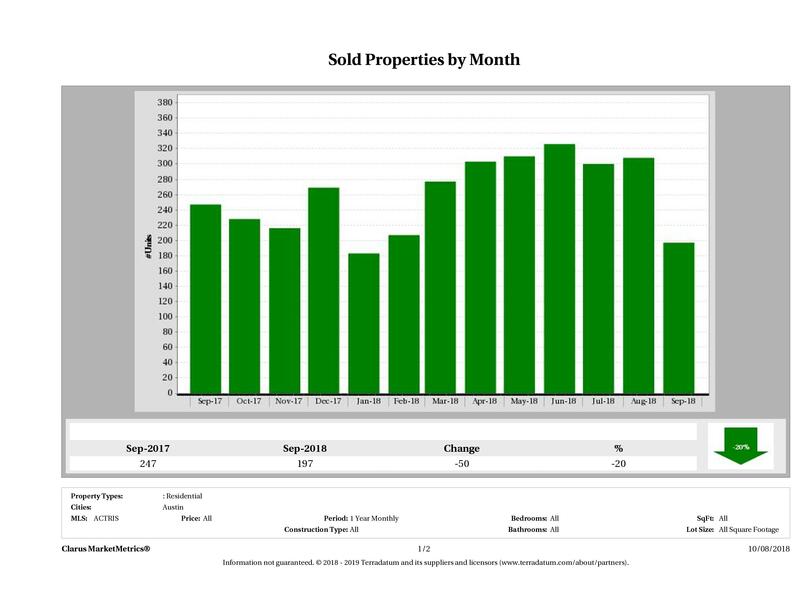 In September 2018, there were 83 condos taken off the market compared to 103 in September 2017. We continue to see unrealistic sellers take their condos off the market vs. lowering the price. This month we saw a 9% decrease in the supply (number of condos for sale) and a 20% decrease in demand for Austin condos. With supply & demand down, the condo market has cooled this month. In September 2018, there were 198 condos and townhomes that sold in Austin. Condos ranged in size from 373-3,772 sq ft with 0-4 bedrooms and 1-4 bathrooms. The most expensive condo that sold in Austin sold for $948,450 and the least expensive condo sold for $100,000. It took, on average, 54 days to sell a condo in Austin and sellers received, on average, 96.32% of their original list prices. The average price per square foot of a condo sold in Austin in September 2018 was $276.11. If you are looking strictly at the numbers, it appears as though the recommendation is – it is time to sell. 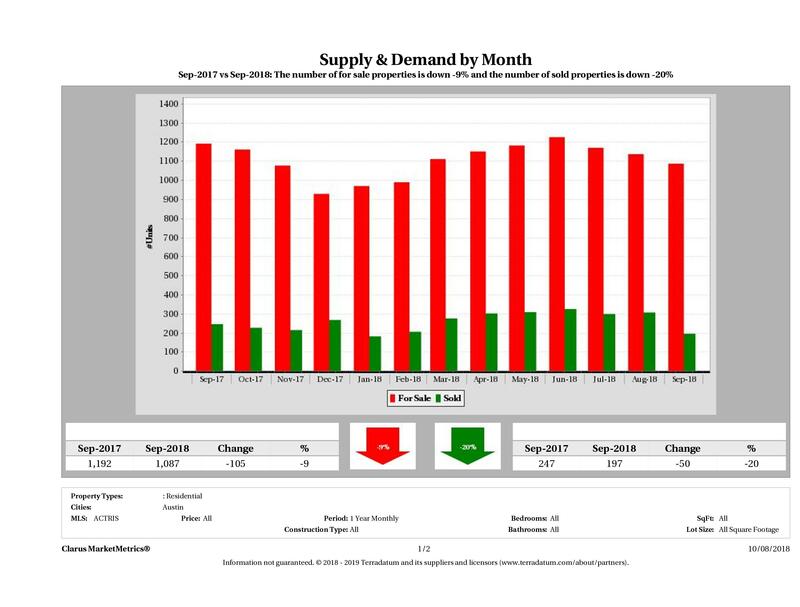 Prices & demand are up, while supply is down. Sellers who position their condos as values are positioned to do well this month.